Your interest in South Bay Driving School is greatly appreciated. We are experts in the field of driving instruction and we intend to give you the best service possible. Learning to drive will be easy and enjoyable with us. “We offer only private driving lessons to ensure the driving instructor’s undivided attention” and to provide continuity in the learning process. We have more than 25 years experience instructing both teenagers and adults since 1985. 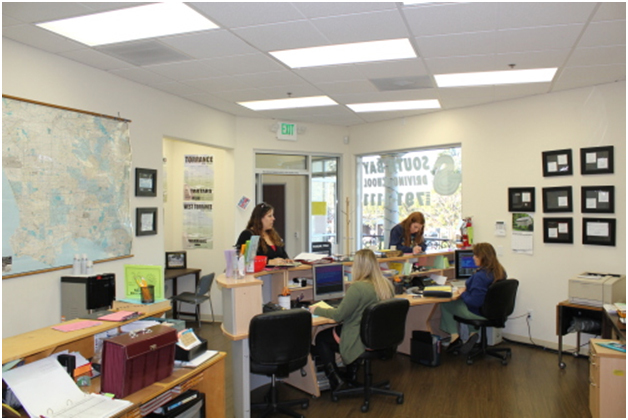 Why choose South Bay Driving School? We have friendly, courteous, punctual and well-trained male and female driving instructors. Our instructors are trained in the most modern techniques of instructing and are licensed by the State of California through the Department of motor Vehicles. It is a California law that each instructor be trained for a total of 60 hours, and we insist they continue learning with additional materials on their own. We offer convenient scheduling seven days a week. We have quality service at reasonable rates. Each lesson is private from beginning to end. We have quality service at reasonable rates. We include pick-up and return in our driving instruction packages. This is especially convenient for busy people who find it difficult to take time off work or leave household duties to transport themselves or their children to their driving sessions. South Bay Driving School has been licensed by the State of California through the Department of Motor Vehicles. All vehicles have been inspected for safety and are bonded and insured by reputable insurance companies. Our license number is #3609, if you wish to inquire at the DMV. We utilize late model vehicles for all driving instruction. Our vehicles are dual control (brakes only, as we have found through experience that dual steering doesn’t allow the student to feel they are actually doing the driving). We also offer driving lessons for adults who are beginning or who just needs some more practice to build up his/her confidence. Our courses offer the novice training in the fundamentals of driving skills, knowledge of driving strategically in traffic, a review of basic laws and rules of driving, as well as instruction in freeway driving and emergencies. The 18-hour package (nine, two-hour lessons) is perfect for adults who have very little to no experience in driving. The 12-hours package (six, two-hour lessons) for intermediate driving is a good package for those who have some experience behind the wheel, but need a little practice to pass the road test at the DMV. We offer both driver’s education and training for students under the age of eighteen. Drivers education can either be taken online. After driver’s education, the student will take his/her written test at the DMV. Once the learner’s permit is obtained, the student is required to take to six hours (three, two-hour lessons) of driver’s training. We also offer driving lessons for adults who are beginning or who just needs some more practice to build up his/her confidence. Our courses offer the novice training in the fundamentals of driving skills, knowledge of driving strategically in traffic, a review of basic laws and rules of driving, as well as instruction in freeway driving and emergencies. The 18-hour package (nine, two-hour lessons) is perfect for adults who have very little to no experience in driving. The 12-hours package (six, two-hour lessons) for intermediate driving is a god package for those who have some experience behind the wheel, but need a little practice to pass the road test at the DMV. The refresher course is the six (6) hours lesson (three, two-hour lessons). This package is ideal for an adult that wants a refresher on driving and/ or preparation on the DMV road test. There is also the option of taking just one driving lesson (one, two-hour lesson). If you decide to continue with more than one lesson, you can upgrade to a larger package by paying the balance of the larger package. You are in control of the lessons you choose to take. Whether you take one or twenty lessons, we are at your service. We have no contracts to sign. In order to assist you in getting your California driver’s license, you may take advantage of taking your road test in the vehicle you were practicing in. Since you are already comfortable in this vehicle and familiar with the traffic in this vehicle, you are more likely to pass your test on the first try. We offer a discounted charge on your test day for this service. Now that you have the facts give us a call and schedule one lesson to see how you like us. We are looking forward to serving you!